‘Cooking’ Lotion Divine this weekend! Gift Sets coming soon! 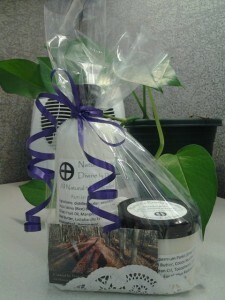 Now available from DeZine’s by request are 16 ounce bottles of Lotion Divine! I will be making a batch of Natural Scent/Unscented as well as Run in the Rain which is by Best Seller! An amazing uplifting and refreshing blend of Peppermint, Wintergreen and Clove that sinks in and hydrates your skin like no other! Also COMING SOON are wrapped and ready to give – Gift Sets for any occasion and of course Mother’s Day! They will range in price from $15 – $30. What kind of goodies would you like to receive in a GIft Set? Please post your comments below!